I didn't participate in indian cooking challenge since last two months as i didn't had muruku presser with me and other one i didn't had guts to attempt it.At home we all love bengali sweets and i have blogged about Rasgulla .We always buy halidram's tin almost 2-3 times a month,my hubby loves it and gobbles half of the tin.Half of the procedure is similar to Rasgulla and is quite easy to make.Just check manjula's video for the detailed procedure.I recommed that website because i learned making rasgulla's from that site. Take a cooker,add water and sugar.Let it boil for sometime. Knead the panner and corn flour for 5-8 minutes or till your hands are oily.Make small size balls and slightly press on the top.Be careful when making balls and they tend to increase the size when cooked.So always make small size balls. Slowly drop these balls in the boiling sugar syrup.And close the cooker and wait till u get one whistle and switch of the stove. Remove the balls and squeeze the water. Keep aside. Take the 1/2 liter of milk and boil till it is reduced to half. Add sugar and cardamom .Mix well. Slowly add the panner balls to the milk syrup and switch off the stove. Let it cool and refrigerate it.Sprinkle almonds and pista when serving. 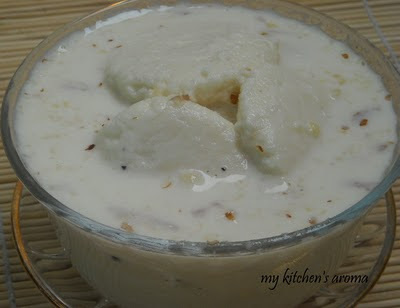 PS:-The panner has to be knead very well.There should not be any cracks while making the balls,if there are any cracks the panner balls disintegrate in the sugar syrup.If you find any cracks just knead it again and if you think it is too dry just add 2-3 drops of water and knead again.Your ras malai shapes depends on your kneading the panner dough. Slurpppp!!! !feel like having still some eventhough i finished mine...delicious!! 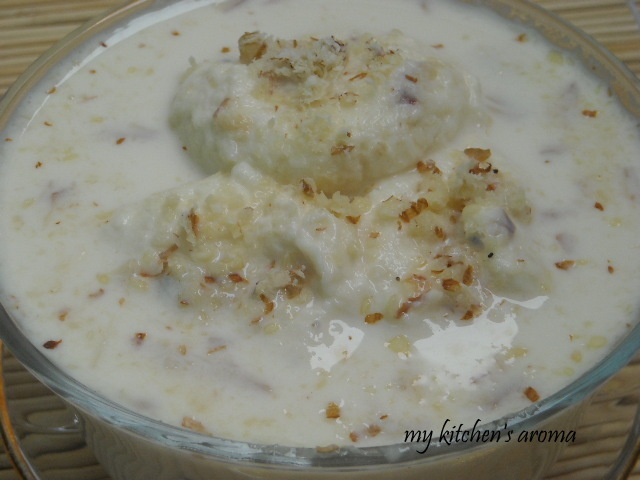 Even I made these yesterday... Yummy ras malai! Very nice..thanks for joining me Varunavi..Mine will be up twm..pls link yours once mine is out! 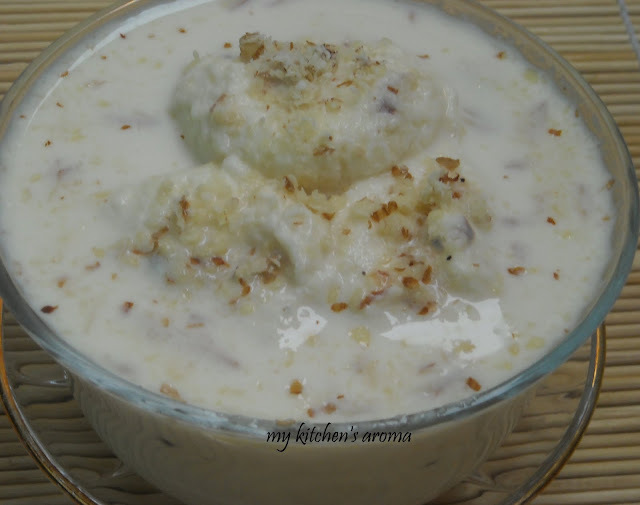 The blogging sphere is now loaded with ras malai recipe.I see that you have tried manjula's recipe.The ras malai looks good. Rasmalai looks really yummy. Thanks for visiting my blog. I enjoyed making them too. They look perfect & yummy. Ras malai looks delicious and abeautiful effort you have made. Such a decadent dessert to prepare n all time fav.Like to have it any time.Luscious looking dessert. yum... rasmalai looks just perfect. it seems easy after i read your post-now got to try.